We live in a world that every house has multiple access points and routers. 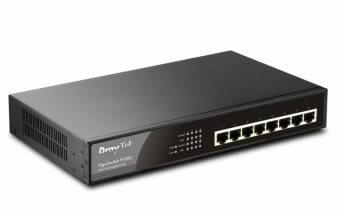 The Vigor Switch P1090 brings them all together in one place so they can talk to each other and also provides them actual electrical power and internet at the same time so you don't have to connect a power adapter to WIFI access points anymore. This is a breakthrough since it allows you to put the access points in places where you don't have electrical sockets, the POE Switch P1090 will handle all that. The Vigor2925ac is meant for the family that has a never ending demand to be and remain connected. This WIFI router is in no means just an ordinary router. The evolution of technology is inevitable. The less the wires running in the home/office, the better. The Vigor POE switch sends power and internet to access points. The same cable will spread your internet in the room and be powered at the same time so you don't need to attach a power adapter to the devices anymore.